The majority of my paintings are done in acrylic on board. I use plywood or other unframed wooden platforms that I either find or purchase used at thrift shops. I find unfinished wood to be a crude but excellent medium for washes that reveal the texure of the wood grain that often dictate the flow of the work. Most of this wood has an existing patina or surface that works well with the found object aspect of the works I create. The paintings are usually abstract in nature and loaded with paint which I use to create a sculptural texture. My palette is a simple combination of whites, browns, gold and silver hues and often mixed with sand or gravel to give the paint even more texture and a heightened three-dimensional affect. I am especially enamored of Josef Albers, Paul Klee, Hughie Lee Smith, Samella Lewis, early Scott Reeds and Caravaggio to name a few. In late August of 2005 Hurricane Katrina struck the Gulf Coast and laid waste to the city of New Orleans, my hometown. I sat and watched in horror with tears in my eyes for days on end as neighbors and the neighborhoods that I knew and loved were buried under 12 feet of water. The feeling of helplessness was overwhelming and yet in some macabre way I knew that these images were the stuff of inspiration and I couldn't wait to get there. The skillet has proven to be a good, pre-fabricated, enclosed platform for creating specific environments. In their previous life, they were used by someone who stared intently into them combining ingredients to nourish the body. I have now attempted to combine ingredients to create an environment where the viewer can stare intently into them to nourish the spirit. Many of the skillets are thematic relative to Black history. Others are abstract pieces bouncing disparate materials off each other. They are, essentially, meditative spaces where the viewer can enjoy a few moments of peace or ponder their next meal. "The Blessed Sacrament Series" combines the seven sacraments of the Catholic Church with a chronological history of seminal figures in Jazz music. Louis Armstrong, as the first figure to popularize and define the Jazz idiom as an imporvisational art form, is paired with the initial rite of Baptism, the first sacrament administered by the church. 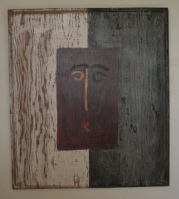 Each Jazz artist is surrounded by the symbols and images used to conjure the spirit of the individual religious ritual. Many of the pieces are still in progress. The pairings will eventually include Louis Armstrong - Baptism; Lester Young - Reconciliation; Bud Powell - Communion; Charlie Parker - Confirmation; Duke Ellington and Billy Strayhorn - Matrimony; John Coltrane - Holy Orders; Miles Davis - Extreme Unction. The majority of my assemblages are contained within boxes. The boxes themselves, either wood or metal for the most part, not only contain the images and create a focal point for a particular concept but many times define the construction of the piece itself. I prefer wooden boxes because of their textural, constructed look and also because objects can be easily attached to them. Finding the boxes is as much a challenge as constructing the piece and finding the necessary materials to do so. All of the artists that I've admired most from Betye Sarr and Joseph Cornell to Lousie Nevelson, Noah Purifoy, Tim Washington, John Outtergridge and many other three-dimensional artists all use boxes of every imaginable shape, construction and material. Boxes that are weathered and exhibit long years of specifc use are the best. Their individual histories as containers adds to the allure of the box itself and is incorporated into the finished piece. The older the better. "The Sanctuary Series" is a series of boxes that are essentially shrines dedicated to objects to be venerated. Throughout history, objects have been held up for worship under the assumption that they are imbued with a particular sacred power as a result of having come in contact with those deemed sainted by various faiths or by having some spiritual power of their own. The objects I've chosen for veneration are those that I personally like to look at. All of the boxes contain candles or flicker bulbs and have a practical useful purpose as indoor lights as do many of my pieces. The pieces are meant to be tabernacles for the repository of sacred objects. What makes an object sacred is its history. How was it used, by whom, for what, when, where, where was it made, by whom, - all of these things give an object its history and this history is, in my opinion, worthy of placement in a repository for reverance.